Since the earlier half of the 20th century, Bettis has stood at the forefront of the actuation industry. Its actuators are installed in almost every energy related industry including power generation, oil and gas transmission, and refining. Bettis has been supplying actuators to the worldwide nuclear power industry since 1969, and boasts over 7,000 pneumatic actuator installations in the U.S. nuclear power industry alone. 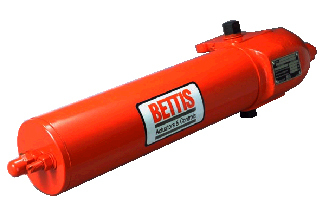 Bettis manufactures a complete line of actuators including linear, rack and pinion, and quarter-turn scotch yoke. These actuators are available in spring return and double acting configurations and provide one of the widest ranges of torques and thrusts in the industry. In 1984, Bettis and Curtiss-Wright Nuclear formed a relationship to provide increased support and service to the Nuclear Power Industry. Bettis actuators can be supplied commercial grade, safety-related, or with full IEEE qualification. Bettis CBB-Series pneumatic actuators are compact, lightweight and ideally suited for automating ball, butterfly and non-lubricated plug valves, or any quarter-turn (90 degree) rotating mechanism. These economical, low maintenance actuators provide a reliable means of automation and are available in double-acting and spring-return models with optional features and controls to meet most actuation needs. Bettis CBB-Series pneumatic actuators are equipped with a scotch and yoke mechanism that transforms linear movement of the piston into a 90 degree rotating movement. The design provides optimum break torque in a package that is simple to maintain and service. Made of high strength alloy steel, the center bar guides the piston throughout its full stroke, ensuring that it never comes into contact with the cylinder wall. Other enhanced features include external field adjustable bi-directional travel stops that are provided as an integral part of the actuator to ensure precise valve travel and protect the valve stem from excess torque. The Bettis G-Series actuator is a premium product, with rugged components for long life in an efficient, space saving package. The G-Series provides a unique, highly reliable means of operating ball, butterfly or plug valves, as well as louvers, dampers and other 90-degree rotating mechanism. The actuator is available in double-acting and spring-return models with optional features and controls to meet minimum torque requirements. 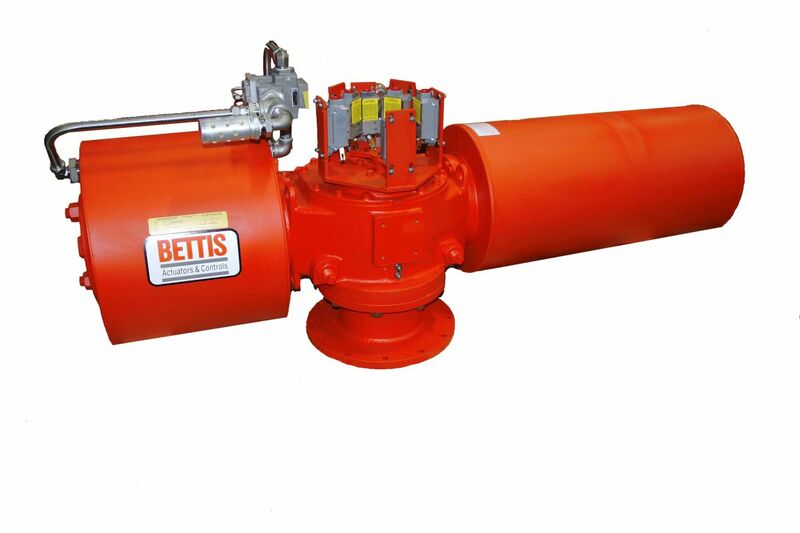 Bettis G-Series pneumatic actuators are equipped with scotch and yoke mechanism that transforms linear movement of the piston into a 90 degree rotating movement. The design provides greater torque at the beginning and the end of each stroke of the piston, precisely where it is required to operate most types of valves. The G-Series is developed on a basic concept by adding the Reaction Bar, the new Power-Swivel, replaceable bearings, highly efficient wear and corrosion resistant coating system, and a tension rod compressed spring. The Power-Swivel connects the piston rod and the guide blocks, compensating for side load deflection, thus reducing wear on the rod, bearings and seals (not available on G1 models). The Power-Swivel piston rod connection is contained by the guide block, which is supported by a high strength alloy steel reaction bar treated to provide a highly corrosion and wear resistant finish. Bettis HD/T-Series pneumatic actuators are designed for Heavy Duty Service, and provide a practical and reliable method for opening and closing valves by remote control without the need for expensive and unnecessary gearing, hydraulic pumps or other motor driven devices. They are ideally suited for automating ball, butterfly, plug valves, or any quarter-turn (90 degree) rotating mechanism. The HD/T-Series actuators are available in double-acting and spring-return models with optional features and controls to meet minimum torque requirements. The Bettis HD/T-Series pneumatic actuators are equipped with scotch and yoke mechanism that transforms linear movement of the piston into a 90 degree rotating movement. The design provides greater torque at the beginning and the end of each stroke of the piston, precisely where it is required to operate most types of valves. The T-Series, a larger heavy-duty actuator, incorporates two internal cylinder tie bars, which guide the piston as it delivers thrust to the yoke. Other enhanced features consists of external field adjustable bi-directional travel stops that are provided as an integral part of the actuator to ensure precise valve travel and protect the valve stem from excess torque.